All Xbox One consoles (Xbox One X, Xbox One S, original Xbox One) are designed to ventilate air to keep them at an optimal temperature during use. Your console may feel hot around the vents, but this is normal. Hot air is being ventilated from the console to cool the interior. Keeping the console free from obstructions and clutter will allow it to ventilate properly. See How to position your Xbox One console for more details. 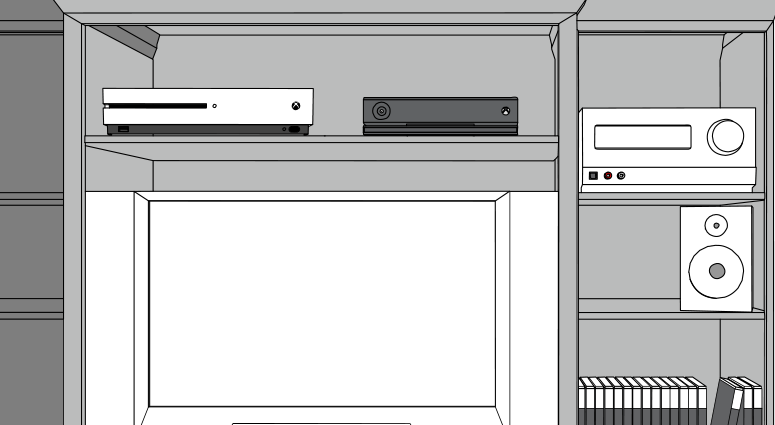 Note If you are using an Xbox One S or Xbox One X console in a vertical orientation, using the proper console stand is required to ensure the bottom vent is not blocked. For more information, go to Using the vertical stands for the Xbox One S and Xbox One X consoles. If the console overheats and shuts down, this is an indication that your console is getting too hot, and you may need to adjust its placement or remove items that may be blocking vents. Do not block ventilation openings on the console. Even something that seems insignificant, like a disc case, may limit ventilation. Make sure the power supply, which has a built-in fan, also has adequate ventilation. See About the Xbox One power supply. Note This is not applicable to the Xbox One S or Xbox One X, which have an internal power supply. Do not place the console or power supply on a bed, sofa, or other soft surface that may block ventilation. Do not place the console or power supply in a confined space, such as a bookcase, rack, or stereo cabinet, unless the space is well ventilated. Do not place the console or power supply near any heat source, such as a radiator, heat register, stove, or amplifier. Very hot heat sources can damage the console. Avoid excessively dusty environments, which can reduce thermal performance. If your console consistently shuts down automatically due to ventilation problems, even after the console is free from clutter and no vents are obstructed, it will need service. You can request a repair from Device Support. Console registration is required to service your console. Would you like to contact Support regarding the "Ventilation for the Xbox One console" issue you were reading about or a different issue?